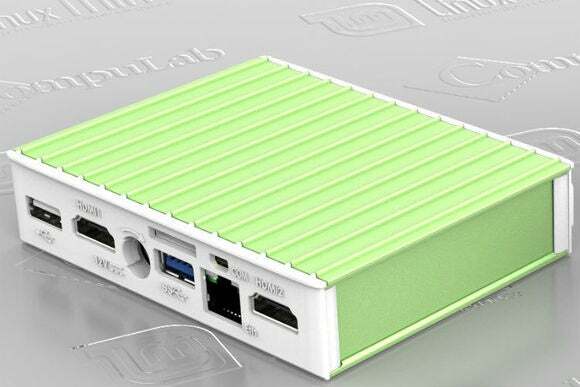 Linux users will no longer be left out of the miniature PC party with the MintBox Mini, a pocket-sized Linix Mint rig, due out next quarter. While devices like the Raspberry Pi have already enabled Linux in diminutive packages, the MintBox Mini should be a clear step up in performance. According to the Linux Mint blog, it'll pack an AMD A4 6400T processor with Radeon R3 graphics, 4GB of RAM, and 64GB of solid state storage. That should be more than sufficient for Web browsing, word processing, and video playback. As the name suggests, it'll include Linux Mint out the box. 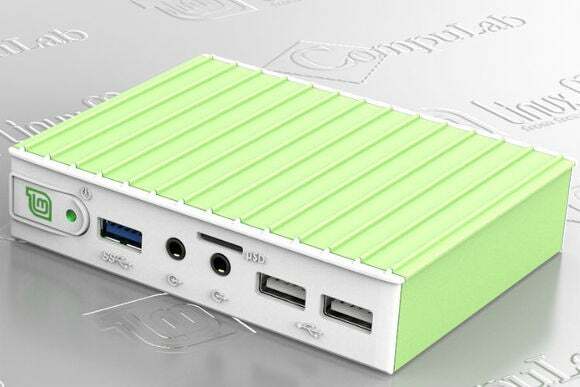 Between the SSD and the passively cooled processor, the MintBox Mini runs utterly silent. As for size, the MintBox Mini will measure 0.95 inches thick, with a volume of 0.22 liters. That makes it three times smaller than Intel's NUC desktops, and five times smaller than the original Mintbox from 2012. It should be small enough to stuff in your pocket. Connectivity options will include two HDMI ports, two headphone/microphone jacks, MicroSD and five USB ports. It'll also have an Ethernet jack and 802.11 b/g/n Wi-Fi. There's no shortage of inputs and outputs on this little guy. There's no word on an exact release date, but manufacturing partner CompuLab plans to offer the MintBox Mini through Amazon some time in the second quarter. It'll cost $295, with a portion of the proceeds going to Linux Mint, and will include a five-year warranty. Why this matters: Miniature, desktop-grade PCs have been gaining traction lately, with Intel pushing its NUC kits and several PC vendors offering their own tiny Chrome OS and Windows boxes. But if you want Linux running out of the box, your options have been slim. While we haven't seen the MintBox Mini up close, there's a chance it could tick all the right boxes for Linux geeks when it launches later this year.